Cuban Agriculture Minister Gustavo Rodriguez Rollero (left) and U.S. Secretary of Agriculture Tom Vilsack listen to Central Iowa farmer Aaron Lehman during a tour of Lehman's farm on June 3, 2016. The path to normalized relations between the United States and Cuba made a stop in farm country Friday. 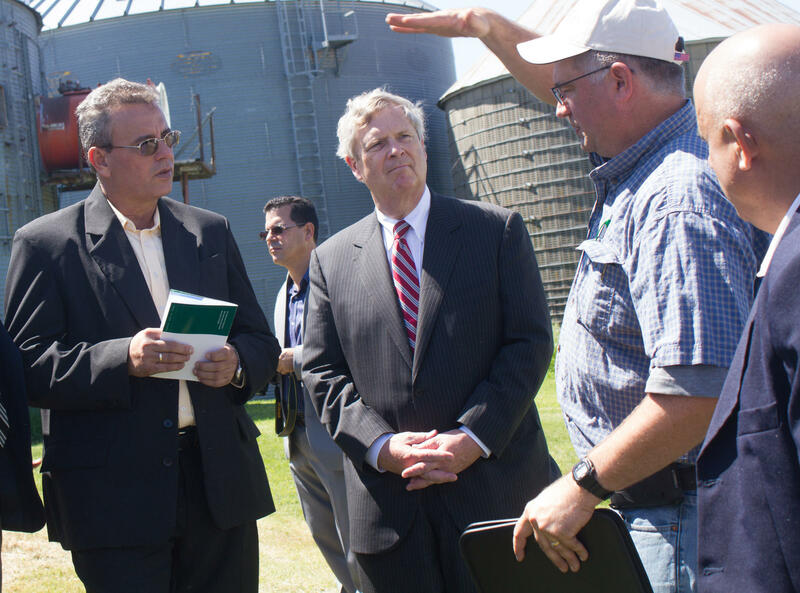 U.S. Agriculture Secretary Tom Vilsack and his Cuban counterpart, Gustavo Rodriguez Rollero, toured Aaron Lehman’s corn and soybean farm in central Iowa. They talked about water, soil, and energy and compared strategies for managing hog manure, which has been a problem in Iowa. Vilsack said he hopes Cuba can increasingly be an export market for farm products like soybeans, rice and, eventually, poultry. 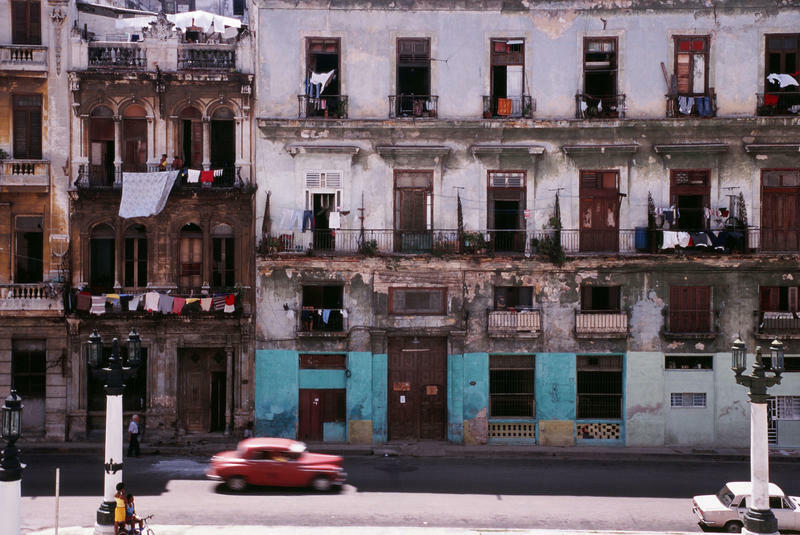 Congress has the ultimate authority to revoke the embargo the U.S. has had against Cuba for decades, but the Obama administration has been chipping away at the long-strained relationship. Vilsack said increased connections between the countries, including an agreement signed between the agriculture departments, is boosting America’s image in Latin America and elsewhere. Cuba recently accepted a 20-ton shipment of rice grown in Missouri. Cuba is an important ally for the U.S. on some hot-button international agriculture issues, such as food safety and animal health regulations, Vilsack said. The Cuban delegation also visited DuPont Pioneer while in Iowa and Vilsack said part of the reason he invited Rodriguez Rollero to Iowa was to highlight the region’s rich history with seed development. Rodriguez Rollero said he was impressed with the company’s operations and he hoped the U.S. and Cuba would work together through science and technology to help farmers in both countries improve their practices. Asked about proposed mergers among several major players in agriculture, Vilsack expressed confidence that any consolidation would not stifle innovation nor curb competition. Vilsack said agriculture also needs to continue diversifying in this country, including the size and crops of farms and who is doing the farming. He said for Cubans, who grow most of their crops without pesticides, the American organic market might present some opportunity. Along the presidential campaign trail, candidates are deriding free trade agreements, like the pending Trans-Pacific Partnership. 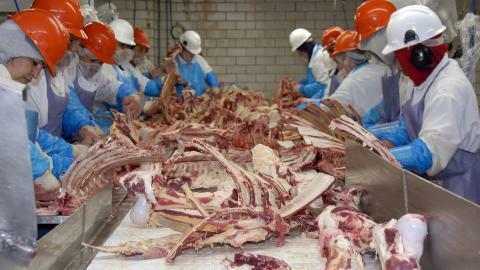 But here in the Midwest farmers and ranchers, the people behind one of our biggest industries, are bucking the trend. Kristofer Husted is a reporter for KCUR's Harvest Public Media. He's based at KBIA in Columbia, Missouri. Chad Hart is an associate professor of economics at Iowa State University, where he's a crop markets specialist.